Crimes against History takes a global approach to the extreme forms of censorship to which history and historians have been subjected through the ages. The book opens by considering the varieties of censorship, from suppression, dismissal, and defamation to persecution and murder. Part I, "Kill switch," tells the tragic story of how the censorship of history has sometimes turned into deadly crimes against history, with chapters looking at topics such as historians and archivists being killed for political reasons, attacks by political leaders on historians, iconoclastic breaks with the past, and fake news. Part II,"Fragile freedom," reverses the perspective and examines how the censorship of history has backfired. Chapters consider the subversive power of historical analogies and resistance to the censorship of history. The book also contains a "Provisional memorial for history producers killed for political reasons (from ancient times until 2017)". It is a double tribute: to the history producers who were killed and to those who mustered the courage to resist the blows of censorship. 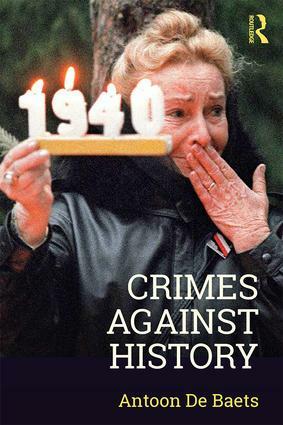 Comparing case studies from across the world and written from a human rights perspective, Crimes against History is an essential resource for anyone interested in how deeply history and politics influence each other, as well as for anyone wanting a fuller view of the history of history.